26/31 Les Winan Clever and charming in a ramshackle sort of way. The plot is surprisingly formulaic. 27/52 Sean Collier Let's save the rec center! Or something like that. 128/196 Max Braden I didn't really get into it, but Kevin Smith fans might like it. A lot of the dialogue seemed improved. Mos isn't great, Melonie Diaz is. Michel Gondry, originally known for his work in video in videos by Bjork, The White Stripes and the Chemical Brothers, has developed a distinctive style as a film director. In turn, this has earned him quite a following of fans. Eternal Sunshine of the Spotless Mind is a favorite amongst BOP staffers, and if The Science of Sleep felt a little off-putting to some, he did manage to counter that with the terrific Dave Chappelle's Block Party. Gondry is behind the camera once again as he directs Be Kind Rewind from a screenplay he wrote himself. 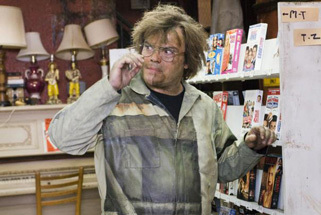 Jack Black stars as - what else? - a lovable loser. He's a man with great dreams, but who simply cannot seem to break out of the blahs he finds himself in every day. One day, Black's character accidentally erases every single tape in the video store where his friend works. To make customers at the store happy, he becomes determined to re-create and re-film every single movie that they will rent to customers. See the latest developments for this project on the Be Kind Rewind Movie News page.